This is a Salad server (fork). It was designed by Clara Barck Welles and executor: The Kalo Shops. It is dated 1910–14 and we acquired it in 2008. Its medium is molded and raised silver. It is a part of the Product Design and Decorative Arts department. Clara Barck Welles left her native Oregon to study at the Art Institute of Chicago. She opened the Kalo Shop in Chicago in 1900; the shop’s name is derived from the Greek word for beauty. After her 1905 marriage to George Welles, she turned exclusively to metalwork design. The Kalo community also included apprentices, since the Art Institute discontinued offering metalwork instruction. These wonderful silver salad servers have a subtle distinction between the fork and spoon, with curved slits for the fork discreetly cutting into the spade shape. The date can be confirmed by their rare mark of “Hand Beaten,” which was added to objects around 1910. The mark was later dropped in 1914 in favor of “Handwrought.” The servers also have an applied initial on the handle. The stylized initials related to the architectural styling of the city and are a significant element of the Chicago Arts and Crafts style. 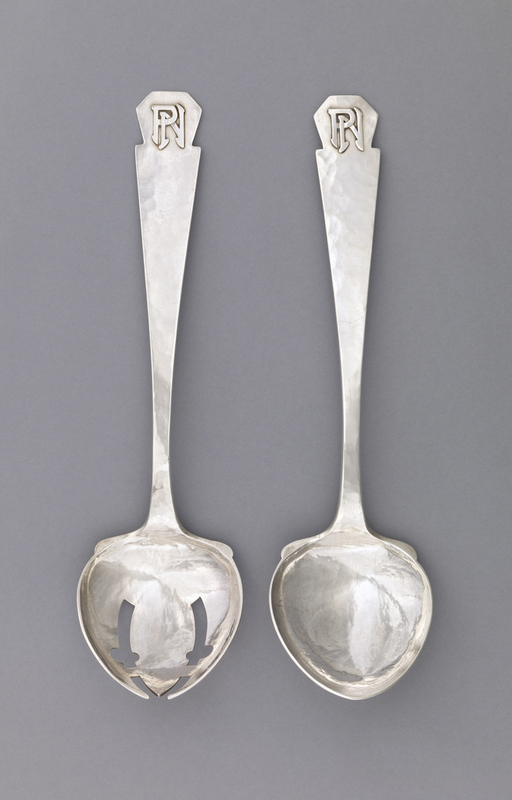 This pair of salad servers proposed for acquisition would be the first example of early 20th-century American Arts and Crafts flatware in the museum’s collection. This object was donated by Pillsbury Michel, Inc.. It is credited Gift of Pillsbury Michel Inc..
Monogram applied at top of handle: "PN"